Bus routes 12, 12B, 14, 14B, 42, 65, 65K, 148 and 149 will be diverted in Espoonlahti from Monday 31 October. Routes 12, 12B, 14, 14B and 42 will be running via Merenkulkijankatu and Kipparinkatu. The buses will not serve Espoonlahdenkatu. 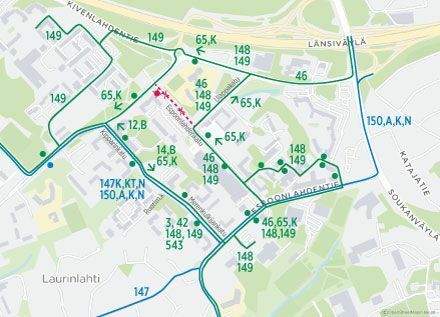 Routes 65, 65K, 148 and 149 will be running along Kivenlahdentie and Espoonlahdenranta. The buses will not serve Espoonlahdenkatu between Ulappakatu and Espoonlahdenranta. Route 46 will run as usual. The timetables for routes 65 and 65K will change on 31 October. In addition, there will be changes to the stop arrival times for routes 12, 12B, 14, 14B and 42. The timetables at bus stops will be changed during week 43. The diversions are due to that Espoonlahdenkatu will be closed to traffic between Maakravunkuja and Ulappakatu due to upcoming construction work. The arrangements will remain in place until further notice. There may be delays to bus services in Espoonlahti already in week 43 due to construction work on bus stops on Merenkulkijantie and Kipparinkatu.